The Historic Hollywood Beach Resort, or “Grand Lady” as it is often referred to is located in Hollywood Florida, in the heart of the 2.5 mile Hollywood Beach Boardwalk and has welcomed families, couples and friends since 1925. This Hollywood Oceanfront Resort sits right on Hollywood Beach, a family-friendly award winning beach featuring the Hollywood Beach Boardwalk, voted by Travel & Leisure as one of “America's Best Beach Boardwalks” and Fodor Travel Guide's “Best Beach for Families. The Hollywood Boardwalk is lined with boutique shops, cafes, restaurants and daily entertainment and if that isn't enough to keep you busy for days on end, our Historic Hollywood Beach Resort also features the Ocean Walk Mall right in the Resort with more shopping, activity rentals from land to sea, cruise port access, café's, restaurants, and bars. The Historic Hollywood Beach Resort offers oceanfront beach dining, entertainment and cocktail concoctions to locals and guests who enjoy the ocean view and people watching on the Hollywood Boardwalk. 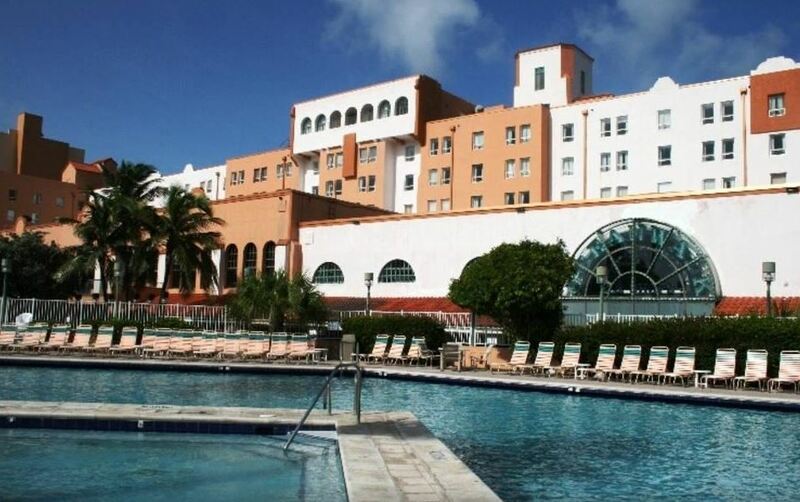 The Historic Hollywood Beach Resort is ideally located just minutes from the Ft. Lauderdale International Airport, Port Everglades Cruise Port, world-class shopping, and many of South Florida's most visited attractions. We also offer easy access to Hollywood and Ft. Lauderdale's sizzling night life. And, if you just want to relax, this is the spot for you. Just grab a book, or your headset, and settle into a lounge chair at our ocean front pool…or lay in our hot tub…or maybe just stroll on one of the best beaches in South Florida. The nice thing about the Historic Hollywood Beach Resort is that you can do as much or as little as you want…It's all up to you! Amazing Food, Drink, and Entertainment! Are all within moments from either our Historic Resort or the Famous Hollywood Beach and Boardwalk! We strive at blending the luxury lifestyle with South Florida's natural wonders!